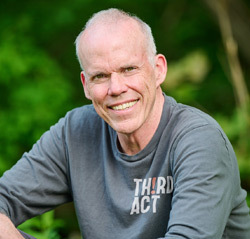 Bill McKibben - Author. Educator. Environmentalist. It’s easy to join the global warming movement. We know it’s easy because we all just joined ourselves. None of us has spent long years as organizers. One of us has spent long years mostly as a writer with a little activism on the side; the rest of us haven’t spent long years doing anything except school, because we just got out of college. But in 2007 we came together to see if we could kick up a fuss about climate change. That January 10, we launched a Web site, StepItUp2007.org. We asked people across the country to start organizing rallies for April 14, to demand that Congress cut carbon emissions 80 percent by 2050. We had no money, and we had no organization, so we had no expectations. Our secret hope, which seemed a little grandiose, was that we might organize a hundred demonstrations for that Saturday, only three months away. Instead, our idea took off. The e-mails we sent ended up spreading virally, in the way that certain ideas sometimes do on the Internet. People we’d never heard of started signing up on the Web site to host rallies in places we’d never heard of. The electronic pins stuck on our online map got thicker by the week—200, 500, 900. By the time the big day rolled around, there were 1,400 demonstrations in all fifty states, ranging from tiny to enormous. It was one of the biggest days of grassroots environmental protest since the first Earth Day in 1970, covered extensively in the national media and in thousands of local stories across the country. Along the way we learned a few lessons and we want to share them in this book, which is designed to help you plan and carry out your own ongoing local rallies and campaigns, the way the thousands of organizers we worked with did on April 14, 2007. We agreed to write it because, one, we haven’t quite managed to solve global warming yet and, two, we gained a few hard-earned ideas for how to make the most of two things: local communities and the Internet. There is no shortage of fine books on activism, from Saul Alinsky’s classic Rules for Radicals through much more recent accounts. Many of them have centered on the very difficult, long-term, and noble task of community organizing—convincing people with too little power to stand up for their rights. We’re mostly talking about something a little simpler here: getting Americans who already care about an issue such as global warming to actually take effective political action. And we think certain things about contemporary America offer both opportunities and pitfalls for organizers. This isn’t the 1960s anymore; an awful lot has changed, even in the last few years. We had an excellent database to draw on: all the people who organized events for Step It Up and then sent us pictures and reports. We interviewed and surveyed a great many of these organizers to learn what worked and what didn’t, and this book is as much their work as ours. (That’s one reason why any proceeds we receive from sales of the book will go back into the climate change movement.) We also drew on our work organizing the biggest climate change protest march to date, in the summer of 2006, as well as various campus campaigns we’ve been involved in. We wrote this book as if you were getting ready to organize a rally in your community and want practical help thinking it through and pulling it off. For “rally,” you can substitute a lot of other ideas—teach-ins, petition drives, phone-banking, voter-registration drives. Any kind of action or campaign, we think, can benefit from at least some of these tips. We also think that our experiences offer insights for those working in other social change movements beyond the environment. We’ll be illustrating our points with examples from our experience, but you’ll be able to see pretty easily how they might fit other causes. We’ll provide detailed, nuts-and-bolts advice, but we’re grouping most of our thoughts more thematically, because we’ve found these organizing principles to be powerful. • Make it credible. You need to know enough about your subject to argue convincingly, but you certainly don’t need to know everything, and you shouldn’t be intimidated by the fact that you’re not an expert. • Make it snappy. Today, it’s easier to organize ad hoc actions on short notice (thanks mostly to the Internet) and harder to get people to join organizations, come to endless meetings, and so forth (thanks to longer work days, commutes, and the like). So we describe the benefits of short-term campaigning for making your point. • Make it collaborative. In an age when our leaders are often hopelessly split along partisan lines, it’s actually quite possible, and quite necessary, to reach out to diverse kinds of people to make a stand against something as all-encompassing as global warming. We think sharing an action instead of owning it is key. • Make it meaningful. People are eager for the chance to do something that shows their real commitment—say, walk for a day (or even a week). In a religious nation, many are eager for the chance to put faith to public use and to take a stand in the places that matter most to them. Moral seriousness makes an important impression. • Make it creative (and fun!). Along with earnestness, we have found that the best actions are fun to do and fun for others to consider. The environmental movement hasn’t been much of a singing movement for years; art has played too small a role. We describe some ways to involve everyone, from actors to athletes. • Make it wired. Activism can’t live solely on the Web—virtual petitions and the like aren’t that powerful. We do think, however, that the Internet has become the crucial tool for building momentum behind the kind of actions that can fight global warming, and we think there are some things to understand as you put it to use. • Make it seductive (to the media). A successful action doesn’t require any coverage at all. But it’s easy to amplify the effect of your hard work if you can get reporters and editors to pay attention. And that’s relatively easy to do if you understand how they think. • Make it last. Ad hoc organizing can lead to future actions, and the nature of working together in the short term often builds long-term bonds. We draw largely on our experience with Step It Up 2007 in this book, but we’ve worked on other actions, some of them successful and some not, that have taught us lessons, too. Organizing is extremely interesting work. (Well, most of the time. Sometimes it’s just filing for permits and waiting in line at Kinko’s.) It’s as much about human nature as it is about political strategy, as much about the small issues of how we relate to one another as it is about the big issues of the day. In his book Blessed Unrest, our friend Paul Hawken said that the movement that is rising to stop global warming and many other planetary inequities will be the largest our planet has ever seen. We want to give you the tools to ensure he’s right. Only three years ago, global warming was off the radar screen for many Americans. Today, it is in the national spotlight and a diverse network of groups is rising to the challenge of stopping it. Hundreds of colleges and universities are working to become carbon neutral, reducing emissions from campuses to zero. Community organizers in Oakland, New Orleans, Detroit, and elsewhere are taking on polluters and fighting for environmental justice. In Appalachia, rural communities are banding together to fight mountaintop removal, a heartbreaking new method for mining coal from that region. People of faith are organizing their churches, synagogues, and mosques, declaring global warming as the moral crisis of our time. Traditional businesses are greening up, while entrepreneurs are building a clean-energy alternative economy that has the potential to create thousands of new jobs. And this is just the beginning. Despite the array of groups and organizations working on global warming, we are still missing a key element: the movement. Along with the hard work of not-for-profit lobbyists, environmental lawyers, green economists, sustainability-minded engineers, and forward-thinking entrepreneurs, it’s going to take the inspired political involvement of millions of Americans to get our country on track to solving this problem. Linked up by the Internet and a common vision, we can start to make change from the local level to the national and global. We hope this book will give you the skills and inspiration you need to jump into this growing movement. It’s hard work, but—take it from us—it can be a lot of fun, too. In 1968, observing the state of civil rights in America, Rev. Martin Luther King Jr. said, “We are now faced with the fact, my friends, that tomorrow is today. We are confronted with the fierce urgency of now.” Today, we are feeling that fierce urgency again for two reasons. The first is that scientists are telling us that we are running out of time even faster than we thought. If we don’t act within the next few years, we won’t be able to avoid the worst effects of climate change. The second reason is a more hopeful one. Recent political changes in Washington DC and around the country have finally created an opportunity for genuine political action on global warming. There is no guarantee that this situation will last. If you’ve been a little paralyzed by the sheer size and horror of global warming, now is the time to start moving forward, fast.